To see maps, traveler tips, more things to do, and tourist information, refer to the Fukuoka trip maker website . Kuala Lumpur, Malaysia to Fukuoka is an approximately 11.5-hour flight. You can also do a combination of bus and flight; or do a combination of flight and train. The time zone difference moving from Malaysia Time to Japan Standard Time is 1 hour. Traveling from Kuala Lumpur in April, things will get cooler in Fukuoka: highs are around 23°C and lows about 13°C. On the 19th (Fri), you're off toBeppu. On the 19th (Fri), witness a stunning natural landmark at Kamado Jigoku, then witness a stunning natural landmark at Hells of Beppu, and then indulge in Japan's hot spring tradition at some of the top local onsens. To see maps, ratings, photos, and other tourist information, read Beppu trip planner. Drive from Fukuoka to Beppu in 2 hours. Alternatively, you can take a train; or take a bus. Traveling from Fukuoka in April, you will find days in Beppu are slightly colder (20°C), and nights are about the same (13°C). Wrap up your sightseeing on the 20th (Sat) to allow time to drive to Kumamoto. 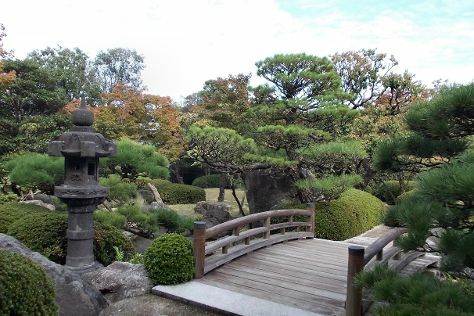 Start off your visit on the 20th (Sat): explore the historical opulence of Kumamoto Castle, take in nature's colorful creations at Suizenji Jojuen Garden, then appreciate the history behind Kato Kiyomasa Statue, and finally make a trip to Shinshigai Shotengai. To find photos, maps, and more tourist information, refer to the Kumamoto travel route builder website . You can drive from Beppu to Kumamoto in 2 hours. Other options are to take a train; or take a bus. In April, daytime highs in Kumamoto are 23°C, while nighttime lows are 12°C. On the 21st (Sun), you'll travel to Nagasaki. You've now added Huis Ten Bosch to your itinerary. To find traveler tips, more things to do, maps, and more tourist information, refer to the Nagasaki day trip website . Traveling by combination of ferry and car from Kumamoto to Nagasaki takes 2.5 hours. Alternatively, you can take a train; or take a bus. In April, daily temperatures in Nagasaki can reach 22°C, while at night they dip to 14°C. Wrap up your sightseeing on the 23rd (Tue) to allow time to drive to Fukuoka. You've added Hakata Station, Kushida Shrine, Ohori Park, and other attractions to your itinerary. Kick off your visit on the 23rd (Tue): enjoy breathtaking views from Fukuoka Tower, catch a live performance at Canal City Hakata, let little ones run wild at Ohori Park, then contemplate in the serene atmosphere at Kushida Shrine, and finally admire the landmark architecture of Hakata Station. To find traveler tips, other places to visit, maps, and other tourist information, go to the Fukuoka itinerary website . Drive from Nagasaki to Fukuoka in 2 hours. Alternatively, you can take a train; or take a bus. Finish your sightseeing early on the 24th (Wed) to allow enough time to travel back home.